Slot-O-Whirl! is a single player Bowser minigame in Mario Party 7. The character arrives on a moving platform. On that platform a giant mechanical slot machine constructs itself in front of the character. 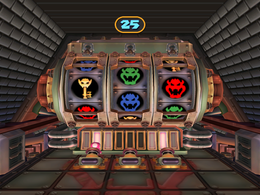 The player must then push for the three individual slots and have them land on the key and not the colored Bowser faces. If a slot wheel lands on a key, the next wheel will spin faster. If the player can get the key to appear on all three slots before the 30-second time limit expires, they win. Rules – "Line up 3 key symbols on the slot machine to get a key of your own and win!" Advice – "Watch the slot's timing and press when the key flies by. It moves fast, so you may have to guess!" Italian Ferma la chiave! Stop the key! This page was last edited on January 1, 2018, at 13:23.